Thank you very much for continuing support to Kumamoto earthquake fundraiser organized by Love for Kumamoto in LA. Since we started our activity, a $35,684.08(as of December 2018) was raised to the Kumamoto Earthquake relief fund and it was sent to Kumamoto prefectural office through Nanka Kumamoto Kenjinkai, Kumamoto prefectural Association of Southern California. Thank you once again for all of your support. Video courtesy of Asteras Corp. In order to support the recovery of Kumamoto Prefecture since the devastating earthquake in April 2016, the volunteer group LOVE FOR KUMAMOTO in LA-Together, Stand for Japan! has planned and carried out various charity activities. On May 28 of last year, we were able to hold a charity event in Gardena due to the generosity of Mazak Corporation, who allowed us to use their premises as the venue for the event. A total of approximately 500 people including volunteers attended the event, and we raised a total of $13,500, which was sent to Kumamoto Prefecture through the Japan Prefectural Association of Southern California. Later in the year, we held a seminar event and a charity potluck, and this year, we requested for donations in a flamenco show, koto music concert, Hinokuni Matsuri event, raising another $14,373 which were again donated through the Prefectural Association. Since the establishment of the volunteer group, we have sent more than $30,000(over 3 million yen) to Kumamoto. 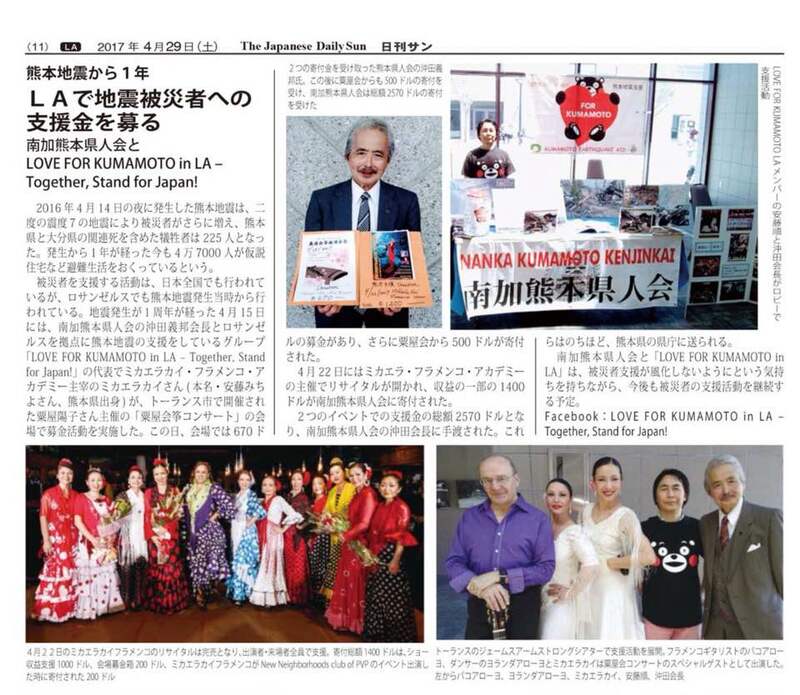 "Love For Kumamoto in LA, Together Stand For Japan!" 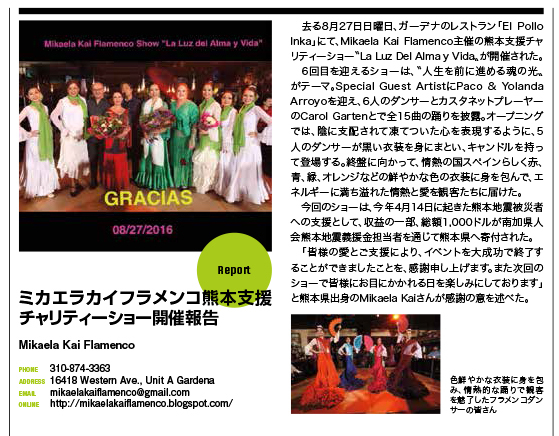 was established by two Japanese, Mikaela Kai(Michiyo Ando) who is a Kumamoto native flamenco dancer, and Andy Matsumoto who is a Nagasaki native businessman and singer after the devastating earthquake in Kumamoto. Nanka Kumamoto Kenjinkai, Kumamoto prefectural association of Southern California joined the Love For Kumamoto Group later. A total of approximately 500 people including volunteers attended the event, and we raised a total of $13,500, which was sent to Kumamoto Prefecture through the Japan Prefectural Association of Southern California.